The magic of travel and overseas experiences is something that often escapes teachers. This episode is all about why you should pursue those opportunities and how your travel experiences benefit both you and your students. 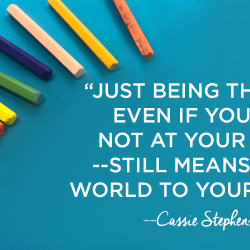 Cassie talks about why preservice teachers should look at overseas options for student teaching (4:00), travel programs for experienced teachers (7:15), and why a plethora of travel experiences might be better than a Master’s degree (12:30). Full episode transcript below. Part of my student teaching experience – and it was quite an experience – took place in beautiful Bloomington, Indiana. And the other half of my student teaching experience took place in beautiful Ireland. That’s right, I did part of my student teaching at a private middle school in County Kerry, Ireland, and it was such an amazing experience. It was my first time to travel abroad and to travel alone. And I have a little notebook that I kept while I was there. It’s filled with sketches of the hostel rooms that I stayed in and sketches of the family that I lived with while I was there. It even has candy wrappers, I ate a lot of Cadbury while there, it’s quite delicious. But my favorite thing to reflect upon when flipping through this book are all of the fun little anecdotes that the kids would say to me. I mean I was probably one of the few Americans that ever had a chance to really sit down and talk to. So I wrote some of my most favorite things and questions that they asked me and I thought that I would share those with you today in my most horrifying Irish accent. So if you are Irish, my sincerest apologies for me butchering at your beautiful accent. So here it goes. By the way, for some reason you’re never really addressed by your full name, you’re always just a Ms. unless you’re not a Ms. and you’re a Mr., in which case you’re a Mr. I digress. “Ms., have you ever been in a drive-by shooting?” “What? No, that’s not something that happens everyday.” Now keep in mind you all, this was back in the late ’90s. “Ms., your President, that Clinton man, do you really think he got it together with that Monica lady?” How do you even answer these? I didn’t, I just shook my head and walked away. The Monica lady, oh boy, not touching that, sorry, nope. And one of my favorites, “Ms., could you pass me a rubber?” In case you don’t know, a rubber, it’s an eraser. Yeah, I didn’t know that. That almost caused a heart attack until the kids explained to me exactly what it was. I did not tell them what it meant to me. You all, teaching and traveling are some of the most exciting things that I think we can do as teachers. So today I want to talk to you about going out and exploring, not just for the pre-service teacher, although if you can do it, man, it’s amazing, go for it. I’m going to share with you today all the travel opportunities that are available for free for teachers. Even if you’re a teacher with a family, some of these travel opportunities are pretty short, and all of them amazing and well worth it. So pack your bags you all, we are going on a little trip in this podcast all over the world. I’m Cassie Stephens and this is Everyday Art Room. Hi. So I thought I’d break this podcast down into three parts. First part let’s talk about pre-service teachers and the travel opportunities available to you. Then I thought I would chat about us more seasoned teachers, the ones with a couple of years under our belts and all the travel opportunities that are available for you for free. And then let’s just chat about traveling in general. Okay, so pre-service teachers, if you have not done your student teaching you already heard how much I loved my experience going overseas. If that kind of piqued your interest, I cannot encourage you enough to look into it at your college or your university. A lot of colleges offer overseas or teaching in other location kind of programs. When i was looking into teaching overseas these were the countries that were available to me. There was Ireland, Scotland, England, India, and Australia. Australia was kind of off my list because it was too expensive of a travel cost for me at the time. India was also very expensive to get to. So it boiled down to me picking between Scotland, Ireland, and England. I basically just drew Ireland out of a hat and I’m so glad I did because I absolutely loved the country, the family that I’d lived with, and the people that I met there. So many memories still resonate. So I cannot encourage you enough, pre-service friends, to just look into it. And before you’re tied down to one certain location because of your job or because of a spouse or a family just think about it. You won’t regret it, I promise. Now my brother, who’s 10 years younger than me, he’s also a teacher, his name is Chris. He’s an English teacher actually. When he graduated from Indiana University as I did, instead of traveling overseas his interest took him to doing his pre-service teaching on a Native American reservation. And he actually still lives … He no longer lives on the reservation but he now lives outside of a reservation but still teaches Native American students on an Indian reservation or a Native American reservation. So even if you can’t maybe afford the overseas experience, just think about getting somewhere beyond your comfort zone. All right, so there you have it pre-service teachers. Go for it, you won’t regret it. Now let’s talk a little bit about us seasoned teachers, the ones with some years of experience under our belts. I started getting a little bit of a burnout around 2007, and I know I’ve shared that with you all. And that was probably not quite my tenth year of teaching. I just was feeling a little bit “meh”. So I started looking into travel opportunities for teachers. And one that really piqued my interest was the Japan Fulbright Memorial Fund Teacher Program. And the reason I say it like that is because when I was there in Japan taking part in this program it was really a stress to us that that was the name of the program, and it’s not to be confused with a Fulbright scholarship. It is not a Fulbright scholarship, it is, I’ll repeat so that you can write it down, the Japan Fulbright Memorial Fund Teacher Program. Now, I applied for this program not once but twice. And I’m telling you this because sometimes these programs aren’t easy to get into and don’t feel bummed out or sad if you get rejected the first time, I did. So there you have it, if you get rejected you say, “Well Stephens got rejected too, so there!” I think that these programs like it you have probably around 10+ years of teaching under your belt so they don’t think that you’re just trying to take advantage of a free experience to Japan. Because I have experience with the Japan Fulbright Memorial Fund Teacher Program I’m going to share that with you. So this is how the program works. Twice a year they bring 200 American teachers to Japan. One time of year is in October, the other time is in the summer. I decided to go during the summer. When thy bring you over to Japan you’re there for not quite two weeks. And I felt like that was a long time for me to be away from my husband. It was the first I had been away from him for that long, so that was a little bit tough. But I also felt like less than two weeks was a doable amount of time. If you have children I’m sure that would be difficult for you, however I’m almost positive no grandparents are ever going to turn away their grandchildren for two weeks. So if you have a spouse that just can’t possibly be with the children for two solid weeks, then keep that in mind. But the reason I’m saying it is because I feel like the length of time was doable enough for people with a family. So when you get there they have all 200 of you spend the first week basically at a convention center. And you are in sessions every day, your afternoons and evenings are free. You’re in sessions every day learning about the history of Japan and their educational system. That might sound a little dry to you but, trust me, it was fascinating. That was the first week. And then it just got better. The following week on Monday we went to an elementary school. And at that point they divided us down into groups of 20. So now you’re with your own little tribe of friends, you’re getting to know then really well, you’re traveling with them. These are friendships that I made for life. The first day you’re in an elementary school. And you know how on Facebook you may have seen the videos of the insides of Japanese schools where you see the kids cleaning the school and vacuuming and all? You all, that is 100% real. It was phenomenal. They literally do stop school right after lunch. I don’t even remember seeing any teachers, I think they were all like hanging out in the teachers’ lounge. But the kids get out the vacuum cleaners, and we’re talking kids as young as probably six years old. They are sweeping, they put on aprons and they put on their little hair net and their gloves, they’re washing the windows. For about 30 minutes they are completely cleaning that school. So the first day we were in an elementary school the entire day. The next we were in a middle school. The following, it was a high school. And then the fourth day we were in a college. And then that last weekend with stayed with a family. So each one of us had a family that we spent that weekend with, really immersed in the Japanese culture. It was phenomenal. I mean I just cannot say that enough. And I would strongly encourage you to look into it. And if you have done it before I would love to hear about your experience, please share in the podcast comments or reach out to me and let me know. But that’s just one. I did just a little bit of Googling and I found several other opportunities for teachers that are paid for. That Japan Fulbright completely paid for it. The only thing you’re going to spend money on is any souvenirs you bring back or any food that you might eat outside of the actual program. There are Fulbright Teachers For Global Classrooms Program, and those are also opportunities for you to travel. I mean I just did a tiny bit of googling. There are tons of places for you if you’re wanting to bring more steam, more science into your room. There are tons of different places for teachers to travel places as far away as Antarctica. So all you have to do is do a tiny bit of searching to come upon some pretty amazing resources. How I found mine was I searched “art teacher travel grants” or “teacher travel grants”. So those are two things that I have done teaching-wise that were funded through the experience itself that I traveled with. Now, let’s talk about traveling just in general. I’m going to say something that might not be applicable for all of you. It’s definitely not going to make everybody happy but I’m going to say it anyway because I get this question a lot. I often am asked if I have my master’s degree and I’m often asked if I would suggest somebody to get their master’s degree. No and no. And here’s why. I don’t have my master’s degree and I’ve really … Gosh, all throughout my 20s and even probably into my 30s I was constantly asking myself, “Should I get my master’s?” Now granted, I know in some school districts where you may work you might be required to get your master’s, and I get it, so this part of the conversation isn’t directed towards you. But in my school district I’m not required to get my masters. And I did my math – amazingly – and when I did the math I realized that I was never going to experience the payout, meaning I was going to have this debt of college but not going to end up reaping the financial benefits. So when I’m asked that question, and I’m answering it very honestly, I would not recommend you do that, and here’s why: take that money and go travel. If you can’t get to experience one of these grants or perhaps one of these programs doesn’t take you to the magical place that you really in your heart want to go to, then save your money, skip maybe spending a whole lot of money on something like a master’s degree unless you have to, and travel. I mean nothing beats the experience of going somewhere that you’ve never experienced before, seeing the sights that you’ve only seen my on your laptop and tasting the food and hearing the languages that you’ve never been surrounded by. I mean I’m getting teary-eyed just telling you how magical it is. Those of you that have traveled, you know. Here are some things that I’ve done travel-wise. My husband works for a German company so I’ve been to Germany several times. I have gone to Paris, France, which is a phenomenal experience. And, like I said, I’ve had the chance to travel to both Japan and Ireland. But oh, I’m so limited, there are so many other places I would love to go to and explore. So I can’t encourage you enough. Like I said, no, not getting your master’s and might be rubbing some friends the wrong way and I’m so sorry, but I’m just speaking from my heart. I feel like life experiences mean a little bit more than a piece of paper. Okay, now that I’ve gotten that off my chest I think that I’d love to hear from you. 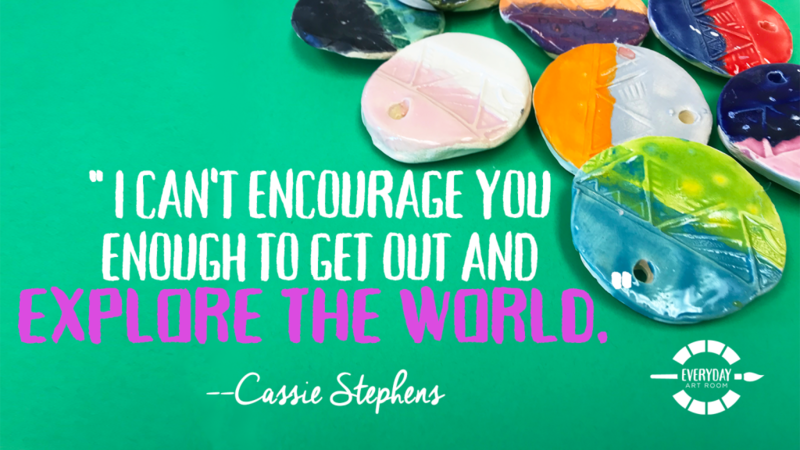 I would love to know what opportunities you’ve taken to travel and how has that affected your teaching. That’s the finial tidbit. 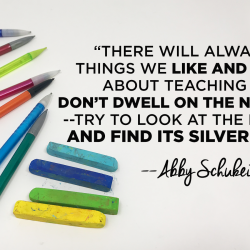 How does it affect your teaching? You know, you can read all about Japan and Japanese culture, you could real all about what it’s like to be in Ireland or France, but there’s nothing like experiencing it and then bringing those stories back to your students, or better yet showing them the photos of you actually standing in front of something like the Eiffel Tower. I mean that’s pretty stinkin’ amazing. Those experiences really are going to ignite an interest in other cultures in your students and might even encourage them to be a traveler like you. Okay, I think I’m done encouraging you. It’s time for me to sign off and dip right into that mailbag, what do you say? Tim Bogatz: Hello, this is Tim Bogatz, the host of Art Ed Radio. Thank you for tuning in to Everyday Art Room. If you’re looking for graduate credits in the next few months make sure you check out theartofed.com under the COURSES tab. We offer over 20 online courses designed to help art teachers at every stage of their professional career. 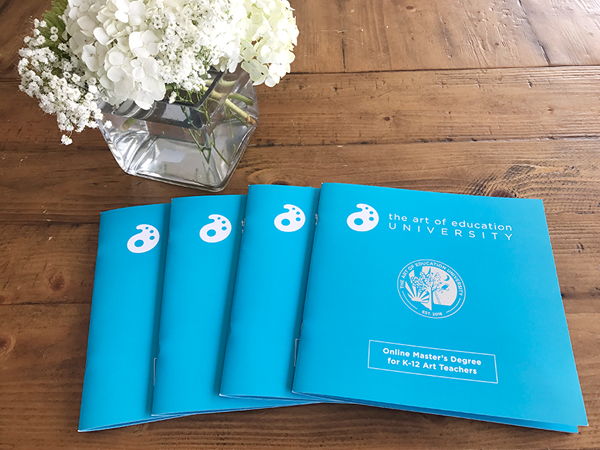 Whether you’re looking to develop a new art curriculum, get help with classroom fundamentals, incorporate new technology into the classroom, or just brush up on your own art-making skills, we’ve got the course for you. Our online graduate courses are practical, relevant, and highly engaging. They’re also fully accredited and perfect for relicensure, logging hours, or earning credits toward your master’s degree. Again, you can check out everything related to these courses at theartofed.com/courses. Now let’s turn it back over to Cassie as she finishes the show. 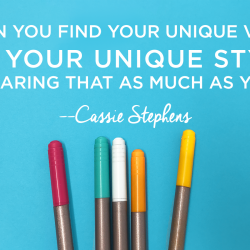 Cassie Stephens: Let’s take a dip into that mailbag, shall we? These questions actually are from my Instagram. And the reason I’m answering them here is because I actually get these questions quite a bit. So my art show is coming up in the middle of May. I’ve been sharing a lot of images of all the matting and the framing, you know what that’s like – the matting, the framing, it’s the fun that never ends. So I recently shared a photo of my first grade projects kind of stacked up, matted and framed. I have about eight two-dimensional projects that my students have done, so let me just dive into that question. How many pieces of art do you put up for your art show? Okay, I’m going to say this to you but I want you to keep in mind that I teach at a very small school, I have about 350 students. I’m obviously the only art teacher. I hang every single projects that my students have made all year. So my first grade students, for example, have so far created eight two-dimensional projects and one three-dimensional project. We still have clay week coming up next week and we still have about a month after that of school left, so I’m sure we’ll have more projects to hang and display. But as it stands, my first graders have eight projects each, and all eight of those will be hung for our art show. Another question was wanting to know how do you hang these works of art? Do you hang them by class or by project? When my art show is hung I work on getting everything matted and framed and I have about a half dozen parent volunteers that come in and they literally hang the entire art show. I know I’ve shared with you before that I used gaffer’s tape and deer mesh. In fact, there’s an entire podcast all about how I hang my art shows. So if you have questions about that you should definitely take a listen to that podcast. These parents hang my entire art show and I let them hang it any way they like. My only rule is two rules: you have to have everything up and nothing can be crooked. If they want to hang it by project they can hang it by project. A lot of them will stack the artwork by student so that when the kids look at the artwork all of their artwork is in the same place, and they can hang it by student. Like I said, as long as it’s up and as long as it’s not crooked I’m totally fine with that. And then my last question was … Oh, actually two more questions about the art show. How do you keep your artwork so flat? Ah, guys, the way to keep your artwork flat is to use high-quality paper. The only paper that I order is 80 pound drawing and painting paper. No matter if the kids paint on it watercolor, collage, it’s always nice and flat, it doesn’t wrinkle. I learned that the hard way in my first couple of years teaching when I would buy the cheap paper and it would wrinkle and I would have to iron it. If you get that thicker paper that won’t be an issue. I will say this: before traveling overseas it’s important that you learn the lingo. Even if they speak the English it’s still really important. Case and point, my last story to share with you from my little notebook. Imagine if you will, I’m standing surrounded by a bunch of Irish middle school boys when the quite handsome Irish PE teacher comes up to me. He and I had gone to be buddies, so I said, “Coach Kelly, do you think you could give me a ride home?” Okay, you all, ride means something completely different to the Irish lads. They all started making some very suggestive motions with their hands and their bodies and giving me the kind of wiggly eyebrow look to which I was horrified having realized exactly what maybe I had said might have meant. And coach Kelly, with his eyebrows equally raised, said to me, “Ms., do you mean you want a lift home? Not a ride, do you want a lift home?” Yes, you all, when in Ireland make sure you get yourself a lift. Thank you guys so much for letting me gush about all my travel experiences. And yeah, get to packing and get to traveling. I, as well, went on the FMFT Program in 2007 (October) and it also took me 2 tries to get in. It was amazing in all aspects. I am so glad to see that, although the program was disbanded, another one has taken its place with a different focus. Since then, at the end of all of my classes, I bow to my students and they bow to me, as students do in their classes in Japan. I would so love to be in a school where we all took off our outdoor shoes to put on our indoor shoes, where students cleaned their classes as a matter of course, not a chore, and that art, music and active activities were high on the priority list. Another traveling resource is local colleges that offer art classes in other countries, some through their con’t ed programs. I have been on four and am always on the look-out for more! This summer Amsterdam and Paris!